The Ocean Venus was on an unusual voyage from Union Bay, Vancouver to Halifax then the UK via Panama when she was struck by Teddy Suhren in U-564 off Cape Canaveral on the 3rd of May, 1942. She was also carrying an interesting cargo of aggregate 9,450 tons: 4,000 tons of lead (leading her to be called the “Lead Wreck” by divers since), 4,000 tons of timber, 1,000 tons of canned herrings and 80 tons of acetone for the Ministry of War Transport. Her pedigree also makes the Ocean Venus stand out: she was building the US – by Permanente Metals Corporation of Richmond, California, in 1942 as a “British Liberty” ship, one commissioned by the UK but built in the US. In fact Ocean Venus was only the twelfth ship built by the yard which was constructed as an emergency measure at the outset of the US involvement in the war. Her owners were John Morrison & Son, Newcastle-Upon-Tyne, who were expecting delivery. To accommodate Britain’s acute shortage of oil, the ship’s engines were fired by coal. This was Ocean Venus’ maiden, delivery voyage and the leg from Colon Panama began on 27th of April, utilizing the Yucatan Channel and Straits of Florida. On the first day of her passage she learned via radio that the La Paz had been struck by a torpedo in the same region which the Venus would soon pass. Her flag was British and she was registered to the port of London. Weighing in at 7,174 tons, her dimensions were 134.4 meters long by 17.1 meters wide by 10.61 meters deep, and her triple-expansion engines could propel her at 14 knots maximum. Captain John Park commanded a total of 46 other individuals, including Third Mate W. W. Bewick, who would give depositions for the Shipping Casualties Section in the UK, from which this report is largely drawn (ADM 199/2140).. The torpedo struck between the boiler and engine rooms flooding them and killing two of the engine crew in the explosion. Amazingly, “the force of this torpedo caused the ship to turn completely round 180 degrees as if she were on a pivot, and we were heading south instead of north.” Though it was supposed the engine staff were killed at their stations, in fact “the engineers’ quarters were completely shattered on both port and starboard sides; the three engineers who were killed were asleep in their quarters at the time”. Since the port lifeboat forward had its bow blown off, the two mid-ship boats were lowered. 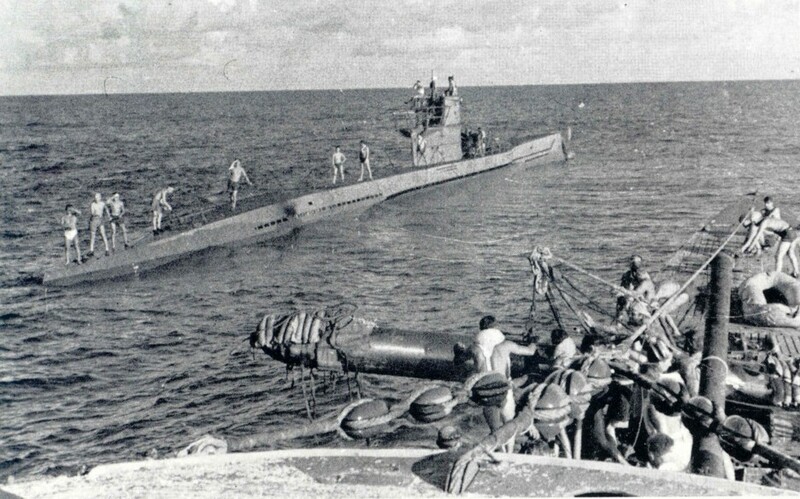 While this was going on, implemented by Abs, “one of the gunners – Sydney Webber – sighted the conning tower of a submarine, and immediately asked the Captain for permission to open fire. In company with two of the other gunners – McLoughlin and Pritchard – he went off and fired 15 rounds with the 3-inch gun at a range of 3,000 yards, and although none of the shots hit the submarine, I’m sure they were effective in delaying the firing of the second torpedo.” (Id). After Wilson, Mather, and Kerry tried to rig an emergency radio aerial with no success, they and the Third Mate, Captain Park, and the three gunners boarded the last lifeboat and rowed away from the ship. “A minute and a half later a second torpedo struck the ship somewhere about the same place as the first one, but on the starboard side.” – This is because the ship had rotated completely, and not because the sub had circled the ship to fire from the landward side. The explosion shot water up 150 feet. He continues: “We were landed at the Canaveral Lighthouse at 100 and from there proceeded to the American Naval Base. The lighthouse keeper at Canaveral denied either hearing or seeing anything of the explosions or gunfire…” – an unusual claim at best. The witness went on to question why the Americans and Allies were still routing ships around Canaveral “in view of the fact that 6 ships have been sunk in this vicinity in 7 days”. He said his protests and observations about the lights coming from shore and perhaps guiding or informing the submarine/s were of no apparent interest to the American authorities. Thirty-eight officers and crew and the four gunners made it ashore. Five of their comrades had been killed in the attack. There were sixty “Ocean” class ships built to the original “Empire Liberty” specifications – thirty were built in California and thirty in Portland, Maine. According to fortshps.tripod, all of the Ocean ships were owned by the British government and paid for by them. After the US involvement in the war they were transferred to the UK under the Lend-Lease Act. The Ocean ships were welded as opposed to riveted. This made them lighter but also more sensitive to conditions (brittle) and prone to cracking of the plates. Because their hulls were smooth they were also more fuel-efficient than riveted cousins, and could be built much more quickly – two important considerations in time of war. Their engines were originally contracted to the General Machinery Corporation of Ohio (fortships.tripod.com/oceans.htm). What was left of the Ocean Venus hull was wire-dragged and exploded by the US Navy and Coast Guard, probably with input from the Army Corps of Engineers, after the war. A Captain Stefanich managed to salvage some 4,000 tons of her lead ingots, which is why the ship is nick-named the “lead wreck” to this day. It lies in roughly 80 feet of water just East of Port Canaveral (Barnette, Volume 1, p.182). True to the Third Officer’s account, “the wreck is oriented with the high stern section, resting on its starboard, side, to the north, and the bow, which barely protrudes from the sand…. Located to the south”. So she really was spun around like a top by the first torpedo.